A newly added etching inspires this weeks chapter. When one copies an artist’s work, it could be called plagiarism if copied exactly but if one uses a different medium or is only influenced by the artist the art produced is said to be after such and such an artist. Today a man who copied many wonderful pieces of art done by renowned artists and in so doing produced very fine renditions of these works in a different medium. #William Giller (1805-1868) was an etcher of supreme talent. 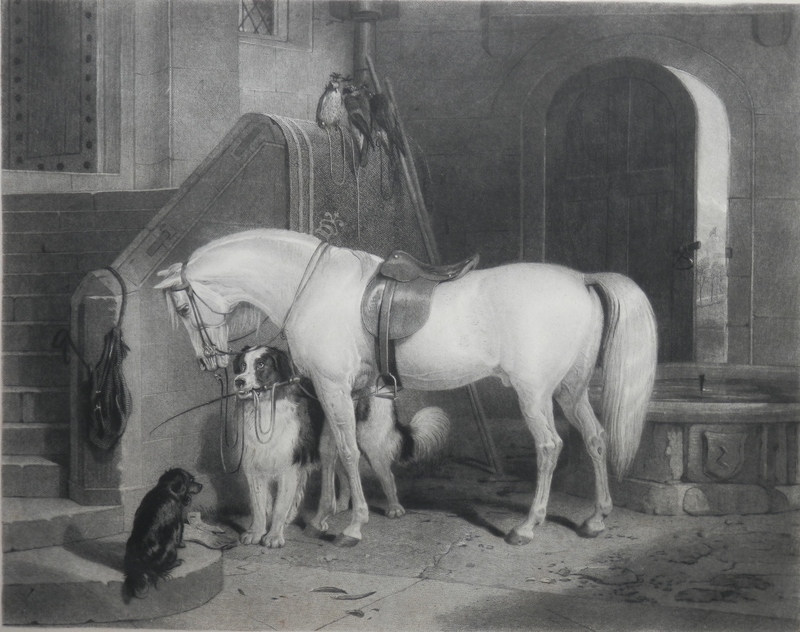 ‘Waiting for Master’ was printed by L. Brall & Son of London after #WilliamGiller had died. Although this etching is titled ‘Waiting for Master’ this is not the title which the original oil painting is known. The original is called ‘Favourites, the Property of H.R.H. Prince George of Cambridge’. It hangs in the Yale Center for British Art. William Giller engraved hunting and sporting subjects as well as portraits. By using various engraving techniques, Giller has managed to capture this image and imbue it with warmth and life. The faithfulness of the dogs to stand and sit waiting for their master, the one holding his master’s whip and mounts reins in his mouth. A days birding ahead – for three birds of prey sit hooded and waiting their time to fly. A superb engraving and fine example of William Giller’s skill as an engraver. This entry was posted in Etching and tagged dogs, door, falcons, horse, horse whip, hound, reins, saddle. Bookmark the permalink.